Lotti’s Requiem is found in a few manuscripts in the Dresden Sächsische Landesbibliothek. Antonio Lotti stayed in Dresden from 1717 to 1719, primarily to write opera for the court of the Saxon Elector Friederich Augustus I. However, it is likely that the Requiem was written in Venice. The occasion for the Requiem is also unknown. Other later sources are in Vienna, Bergamo, Munich, and Warsaw. The work requires an SSATB chorus (with the tenors and basses split into three), with soli for SSATB. Originally, the soloists would have been members of the choir, so the work would therefore be best performed by an ensemble of at least SSSSAATTTBBB, each of whom can hold a line. 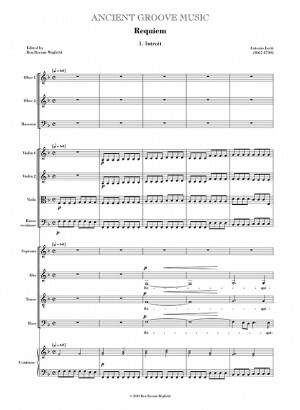 Alternatively, many of the ensemble soli passages could be performed by a semi- chorus, though the Soprano and Alto arias would still need soloists. 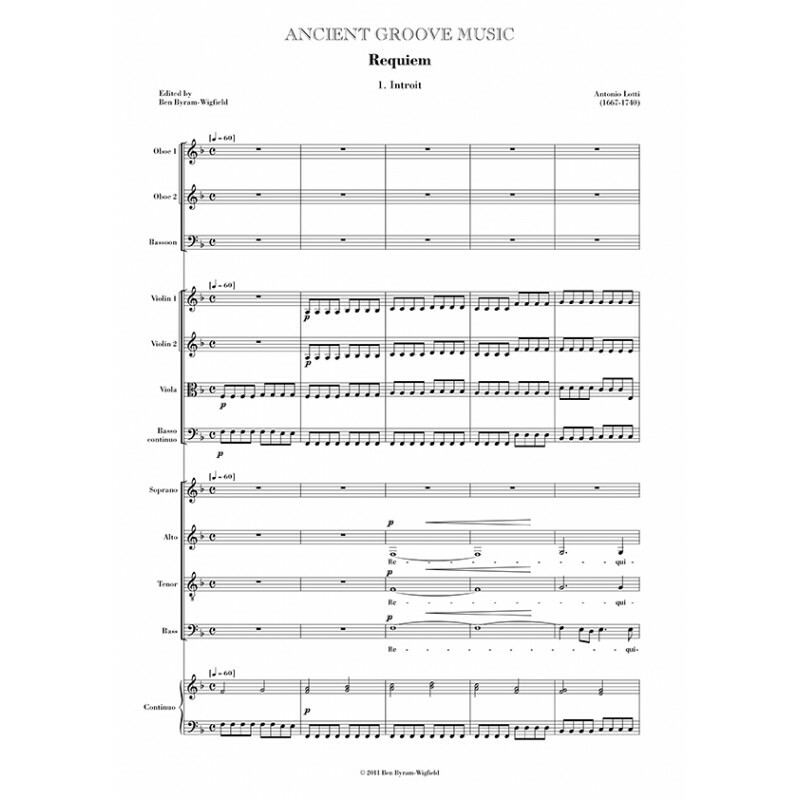 Instrumentally, the requirements are 2 violin parts, 2 violas, 2 oboes, trumpet, and a continuo section of at least cello and organ (plus bassoon, contrabass, theorbo and others). In the Venetian source, the bassoon is not mentioned; the oboes are only scored where they have independent lines. The Dresden parts flesh out the woodwind lines more explicitly, doubling the violins for much of the work. The bassoon acts similarly, as a continuo ripieno. It might be feasible to perform closer to Lotti’s original intentions by removing the bassoon and only using one oboe along with the trumpet. (Coincidentally, San Marco had no bassoonist and only one oboe player in Lotti’s time.) The bassoon part could be used as a ripieno part for a contrabass. The Dresden parts have 3 of each violin, 1 of each viola and oboe, with 2 violoncelli, a violone, theorbo, organ and 2 bassoons on the continuo. Performance time is c. 60 minutes.